Give a gift to a friend or family member! 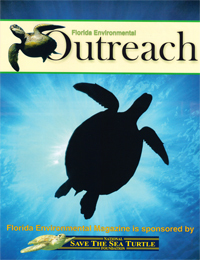 Published quarterly, Florida Environmental Outreach Magazine is a full-color publication full of environmental news, current research, and National Save the Sea Turtle Foundation updates. A sure hit with readers of all ages! 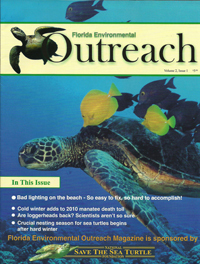 If you have an interesting topic or project you’d like our readers to know about, or would like to advertise your environmental service or product in the magazine, contact Larry Wood at the National Save the Sea Turtle Foundation to submit an article or ad. National Save The Sea Turtle Foundation of Florida Registration Number CH-2841.